Few things are more wonderful at a special gathering than a beautiful roast gracing the center of your table; and when it comes to roasts, few can compare to the splendor of the Beef Standing Rib or the Beef Tenderloin. A high grade rib roast with extended aging is the juiciest and most flavorful roast possible, while the tenderloin offers wonderfully lean and tender slices. When prepared properly, either will make your guests swoon! Tony’s Own Crab Stuffed Tenderloin Roast, call ahead to order at the Tony’s Near you. Quality Grade: The USDA inspects most beef to rate it’s quality. The highest grade is Prime, representing the top 2% or so of all American beef. 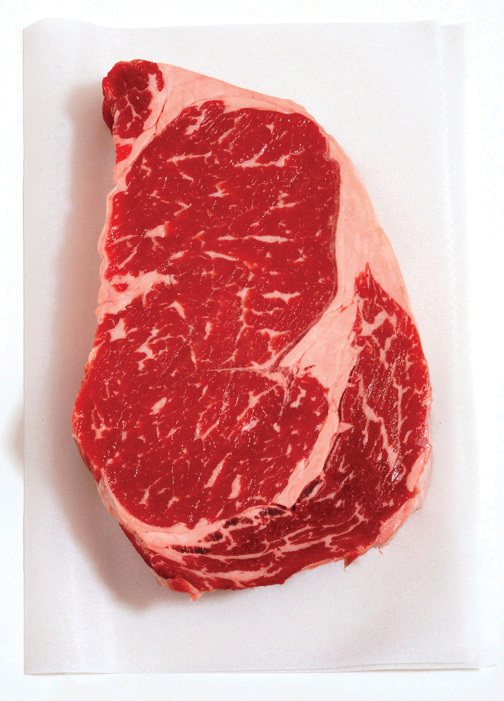 Prime beef is rich, flavorful and juicy thanks to generous marbling (thin lines of fat in the interior of the meat). Keep in mind the term “Prime Rib” does not mean USDA Prime Grade. The next category is Premium Choice (AKA Top of Choice, Choice Plus or High Choice), an industry term representing a combination of the finest 10% or so of Choice beef mixed with some Prime. Regular or Low Choice is a very broad category with little to some marbling, and USDA Select offers marbling levels so low that it’s not recommended for grilling. At Tony’s all our premium steaks are cut from aged Prime and Premium Choice Beef, and we also use some less marbled beef roasts to help keep our ground beef lean, and for some traditionally very fatty cuts to the joy of our health conscious guests. Extended Aging: High-grade beef benefits greatly by aging for 3-4 weeks under specific conditions, lower grade beef does not seem to benefit as much. 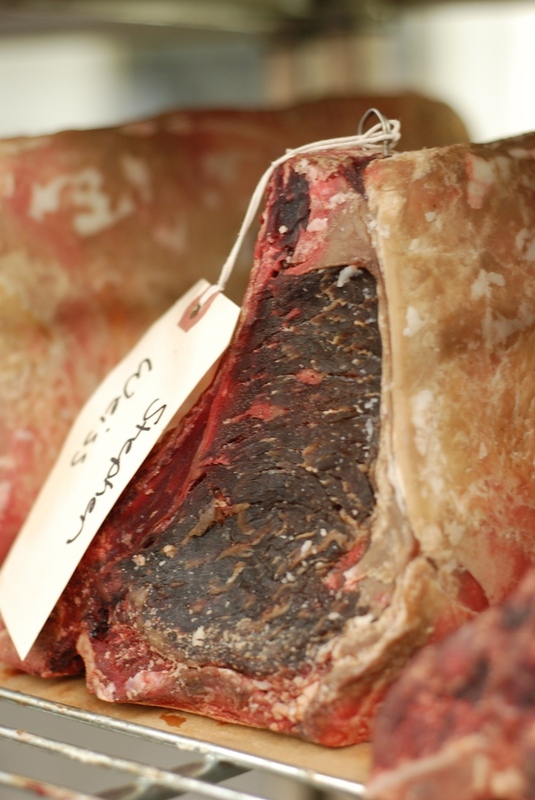 There are two styles of aging; wet or dry aging – learn more about aging here. At Tony’s we use a combination of wet and dry aging techniques. Natural: To be graded as USDA Natural, meats cannot have anything added to them. Injecting meats with flavoring solutions and increasing their weight by as much as 20% is a common way to fleece customers with low grade meats. Tony’s (or any self respecting butcher) has never and will never offer injected meats! Trusted Butchers: The vast majority of beef in this country is of low grade and not aged, so everybody can’t have ‘The Best’ as the ads suggest. Sadly, many retailers will simply tell you what you want to hear to make the sale, stick to a butcher you trust. Beef Tenderloin Wellington – get the recipe here. We feature USDA Prime or Premium Choice Natural beef responsibly raised by local ranchers. This beef is raised on grass for most of it’s life, and finished with grain the last 3 months before harvest, this is how our beef can have such high levels of marbling and flavor. Then we age for 21-28 days and hand cut in house and by hand. This has been our practice since 1978, and we refuse to lower quality to reduce price. Meet one of our ranchers in the video below to understand how our High Grade Beef it raised. All beef is grass fed, but those that never go to a feedlot or are never fed anything but grasses and forbs are considered 100% grass fed. The taste and texture profile is different than premium grade beef, it’s less rich and juicy and the flavor is on the metallic or bloody side – traits that many guests appreciate, especially hunters. It took us a long time to find a local 100% grass fed beef good enough to bear the Tony’s name, but we proudly keep some in stock and can special order anything you’d like, even a custom cut side of beef. Most butchers and chefs agree, the Standing Rib is the ultimate beef roast thanks to it’s juiciness, flavor and tenderness. The best part of the Standing Rib is the Rib Eye, or the center of the roast – the rest is bones, fat and tough ‘lifter’ meat. We always remove the ‘lifter’, ‘feather bones’, ‘button bones’ and excessive fat – so all our rib roasts are essentially Rib Eye Roasts with or without the bone. Note: The Standing Rib is often called the Prime Rib, but don’t confuse this with the beef’s grade. At Tony’s we call a Prime Grade Standing Rib a “True Prime Rib”. Here’s a quick video on how I am cooking my Standing Rib this year! Get the Recipe Here. The tenderloin is beef’s most tender cut. It’s also known as the fillet mignon – and a center cut is called Chateaubriand. This small muscle weighs only about 3-4 pounds and there are only two on each animal – making it beef’s most expensive cut. It comes completely encased in gristle and fat and takes some skill to clean correctly. The tenderloin has an irregular shape, but we roll the roast with butcher’s twine to create a uniform thickness for even cooking. Another great way to prepare this roast is double thick, tying them on top of each other ‘flip-flopped’ turns it into a pretty even roast – and the thicker weight is less likely to be overcooked. All of this is discussed in the video, along with cooking tips. There are many great cooking methods for tenderloin, here is how I cook mine. 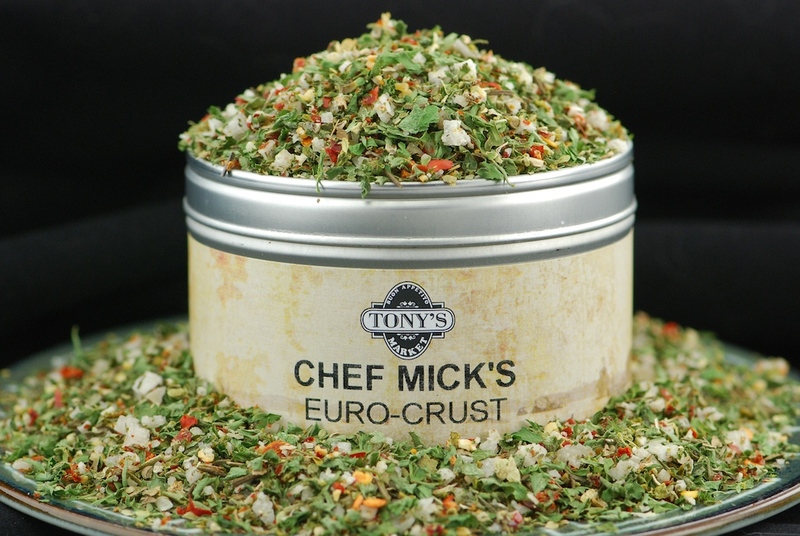 Euro Crust: Large chunks of sea salt, herbs and spices – the perfect blend for beef, bison, game and lamb. Sprinkle it on or blend with lots of minced garlic and olive oil to make a wet seasoning rub / marinade and spice crust. This is a lower sodium seasoning. 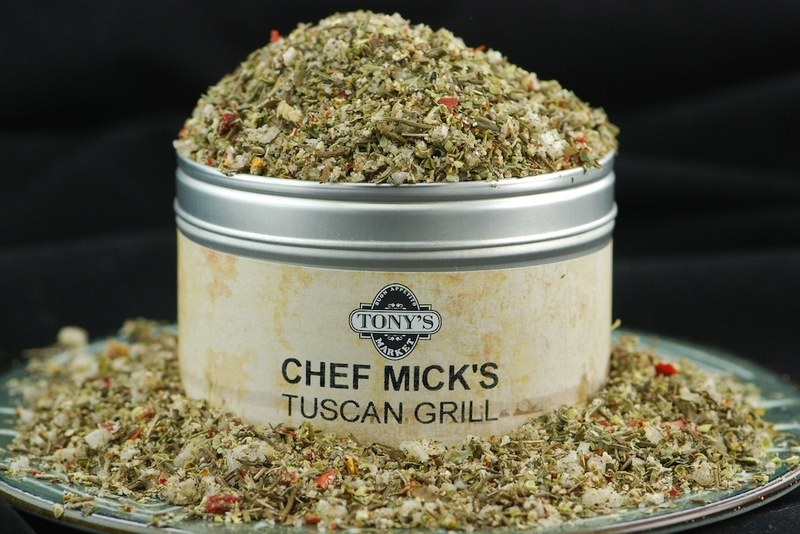 Tuscan Grill Rub: A chunky blend of coarse sea salt with a medley of Tuscan herbs and peppers, particularly good for encrusting meats and seafood, or for general cooking. It’s also great blended with lots of garlic and olive oil to make a wet rub and spice crust. This is a lower sodium seasoning. 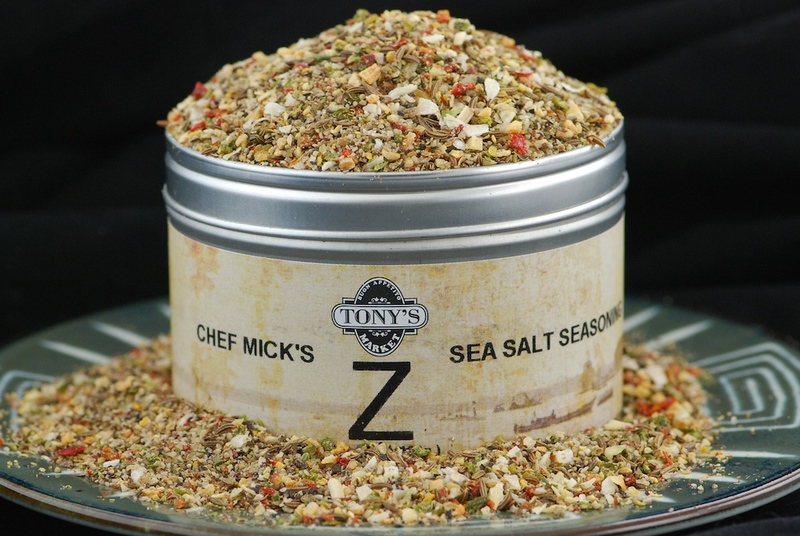 Z Blend: An intriguing, complex blend of sea salt, herbs, aromatics and whole spices with a Northern European flair. Hints of caraway and dill make this very special blend memorable. Balanced, chunky and unique, it makes a great crust on beef roasts and steaks, but is also amazing on pork and poultry. Lower sodium. 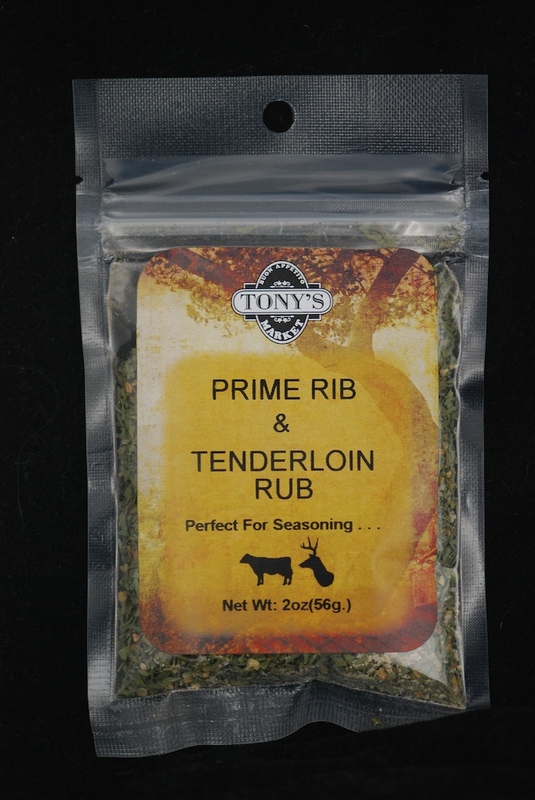 Tony’s Prime Rib and Tenderloin: A garlicy seasoning blend with herbal overtones – particularly good with beef, and also delicious on pork and chicken. 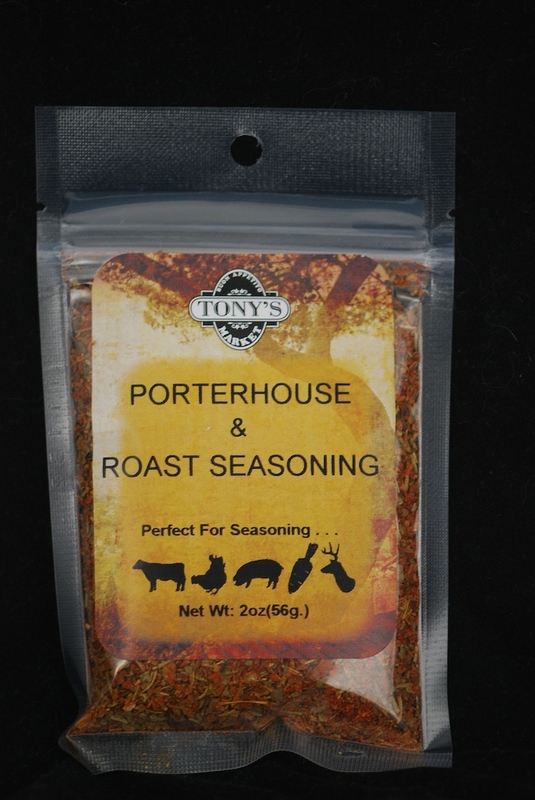 Tony’s Porterhouse and Roast: A zesty blend with plenty of paprika and herbs, particularly good with beef roasts, steaks and burgers – one of our first custom blends and still one of the most popular. 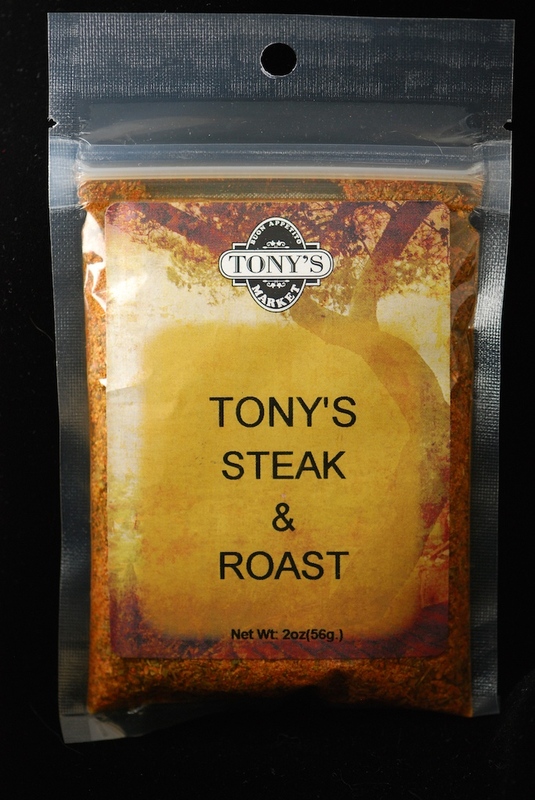 Tony’s Steak and Roast: A fine, particularly balanced seasoning blend with a warm and almost smoky flavor and just a hint of garlic. Great on beef steaks, roasts, burgers and even pork.